On behalf of the management and staff of Limerick Civic Trust, I would like to wish all our Members, Friends, Associates and supporters the very best for Christmas and the New Year. 2015 was a busy year for the Trust and saw the implementation of some management changes in September. The effects of these changes will be documented in the end-of-year report for the AGM in the New Year. We are particularly pleased with the positive feedback from our events, especially the Christmas Lunch, and the discussions that have followed. Central to these discussions is the future of the historic fabric of the city and county and how we might better engage the public, business professionals, the state and its officials. We intend to build on this in 2016 through a variety of conduits and we will keep you posted on progress. In addition to our ongoing efforts to clean our city’s streets, restore key sites and improve river walks, graveyards and public spaces, we are aiming for 2016 to be a year of growth and development. The central remit of the Trust is the conservation of our heritage, in all its many guises, and the protection of our environment through civic pride. More than ever, we require external support to help us realise these goals. So next year we will be increasing our membership drive and actively seeking public and private assistance. There are over seventy people involved in the delivery of the Trusts ambitions and I would like to thank each and every one of them for their invaluable contributions since my arrival mid ’15. 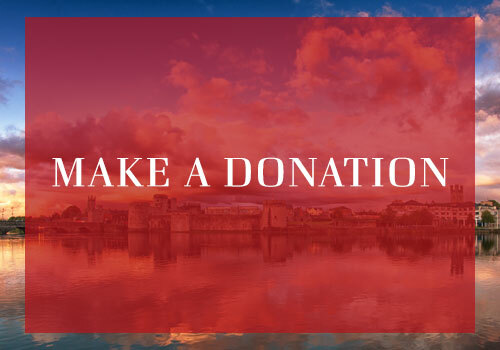 Whether they were involved in the restoration of the church at Mount Saint Lawrence, the maintenance and cleaning of the canal, the graveyards, or working in Bishop’s Palace and supporting the changes, their assistance and hard work helped us promote the good name of the Limerick Civic Trust. Last, but not least, there is the executive, who give so much of their time and effort to guide and support the management of the Trust, along with the tireless efforts of our Chairman, David Deighan, who deserves a special mention for his support during the changes this year. Every best wish for Christmas and the New Year and we look forward to being in touch more regularly over the course of 2016.